In 1979 Peter moved from London up to West Yorkshire and started making guitars in his spare time. 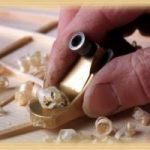 Having secured a place at West Dean Musical Instrument Workshop in Sussex Peter’s dream to become a full time instrument maker was realised. 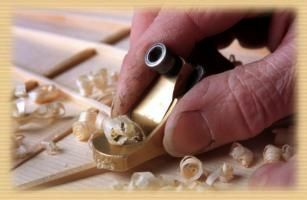 Under the direction of Roger Rose he learned the traditional methods of instrument making to the highest standards. 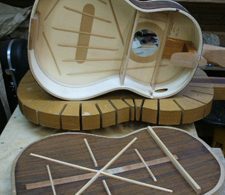 The workshop specialises in the making of early musical instruments, Baroque lutes, guitars, viols, violins, cellos and basses. The West Dean Workshops have a well deserved reputation for producing superb instruments and apprentices are expected to work to professional standards. In 1986 he returned to Addingham in West Yorkshire to set up his own workshop as a full time Luthier making classical guitars. 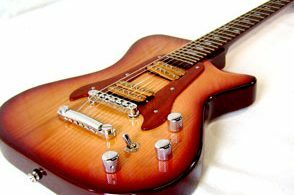 Since 1986 he has concentrated on making classical guitars, but has also made a number of steel string acoustic guitars.